An Egyptian chemist detained in Cairo has been cleared of any links with the London bomb attacks, officials say. An interior ministry report "made clear there was no link between Magdi al-Nashar and al-Qaeda or the bombings", a government spokesman said. British police have not formally named Mr Nashar as a suspect in their investigation. The 33-year-old, who was arrested last week, has denied having any role in the attacks that left 56 people dead. On Saturday, the Egyptian interior minister said that reports linking Mr -Nashar to al-Qaeda were "groundless" and based on a hasty conclusion. 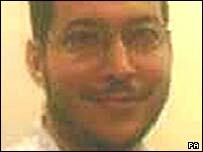 Mr Nashar, who completed a PhD in chemistry at Leeds University, was arrested in Cairo as part of the inquiry into the 7 July bombings. He is reported to have admitted knowing one of the bombers, Hasib Hussain, and helping to arrange the rental of a flat in which traces of explosives were found. Mr Nashar told Egyptian investigators that he had intended to return to Leeds at the end of a holiday in Egypt, which began a week before the bombings.